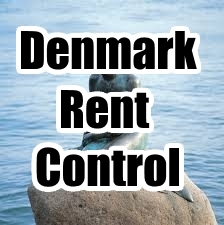 In this post, we will be discussing the rent control strategies employed in Denmark, and their impact on the economic recovery and growth of the country. Of the countries we have analysed so far, Denmark ranks among the top in most complicated, convoluted rent control systems. The Danish housing market is composed of four primary sectors: owner occupied housing, cooperative housing, public rental housing, and private rental housing. The Danish system of rent control is predicated on the belief that landlords should not profit from letting their property; landlords can, therefore, only pass on day-to-day property costs (including property taxes) and a predetermined amount for the maintenance of the property. The Rent Act provides the general provisions of the contract between landlord and tenant, and pertains to the technical aspects of the tenant relationship. There is also allowed a capital charge, which varies between 7% and 14%, depending on the age of the dwelling (properties built after 1963 receive higher allowances). However, this capital charge is calculated using the value of the property from 1973 which no adjustment for inflation, and is therefore not an adequate means for the landlord to recapture some of the value of their investment. Furthermore, landlords do not have the right to raise rents solely based off of an increase in demand for the property, further subverting the natural market mechanism. Rents for all properties built after 1991 are exempted from these provisions of rent control, but the number of properties built after 1991 which remain private rental housing is incredibly low (estimated at 6% in 2002). A significant portion of the Rent Act is invariable, and therefore cannot be altered from the model prescribed by the legislature. In the event that any clause of the contract is altered, it may only be changed in favour of the tenant, and not the landlord. A unique feature of the Danish private rental market is that whenever a privately owned rental property is listed for sale, legislation dictates that current residents have the right to assume ownership of the property at the offering price, and convert it to a cooperative. Since the price typically reflects the controlled rent, properties taken over in this way are reflect favourable conditions for the residents, and so the number of private rental dwellings is on a decline, despite increased construction. Opponents of rent control argue that rent control regulations of this sort cause severe inefficiencies in the market. Rent control measures contribute to the misallocation of housing and lack of housing for those most in need, cause a lack of economic profits for landlords, which contributes to a decrease in quality of available properties, and cause a lack of mobility in the housing market. Current rental yields in Copenhagen have remained stagnant at 4.84% for a 120 sq. m. apartment in the city centre for the past 3 years. Returns of this sort, while moderate, do not attract institutional investment, and are prohibitive to individual investment, due to the maintenance expense inherent in these properties. According to the OECD, in their latest Economic Survey of Denmark, economic recovery has begun in Denmark after the collapse of 2008, with a 0.6% increase in GDP in Q2 2013, and subsequent growth from then on, but there is significant risk that a new housing bubble is on the verge of forming. Currently, interest rates in Denmark stand at -0.65%, a measure that was intended to prevent speculation during the economic crisis of 2008, but are now threatening to recreate the housing bubble which caused the banking crisis in the first place. Property prices in the most desirable Danish locales are on the rise, fuelled by the bank-led incentives to borrow and invest. As it stands, this is compounded by the astounding amount of debt of the average Danish citizen; in Q2 2013, household debt sat at 296% of disposable income, due to the prevalence of interest-only mortgages, the house price-to-income ratio was established at 109% of its long-run average, and the average household in Denmark spends 25% of its disposable income on housing costs. Currently, these mortgages are being paid down at an average of 2% per year, and when the interest-only periods of these loans end, the monthly payments due will quickly increase. According to the International Monetary Fund, Danish portfolios are among the most illiquid in the European Union, and so this increase in mortgage payments could cause significant problems for the less stable borrowers. Again, according to the OECD, the economic recovery from the property price collapse is nearing its peak. If no policy change takes place, the current prolonged period of negative interest rates may simply restart the cycle, and cause a further contraction that many homeowners and landlords could not afford. This post was contributed by Brandon Nero, University of Florida. Danish housing is a mess. There is some new housing, but the lack of new housing isn’t a failure of the market, as some would like to make out. Rent controls and land controls (development restrictions) work hand in hand. Rent controls encourage converting the existing stock to owner occupied (in the Danish case, to comply with the idea that profits are evil, rather than profits being a signal to guide where to invest), and land controls block construction even if it were profitable to build. So there it is – you can wait up to 20 years for your rental! The way to clean up this mess would be vacancy decontrol upon payment of the tenant to leave, or when the tenant buys the property.